From English as a second language student... to Outside Manager! At the beginning of October I had the chance to join the last pack trip for the summer as an assistant guide and it was truly spectacular! As I saddled my trusty horse ready to embark on an adventure of a lifetime, little did I know just how lucky they would be. During my seven day pack trip up to Spruce Lake we were blessed with six and a half days of blue skies, sunshine and stunning vistas of winding rivers, glistening lakes and alpine mountains. On my sure footed mountain horse, I went on a day ride with the guests up to Windy Pass (2200m), the view from the top was truly amazing. During this trip I got to put a lot of my horse skills into practice and learnt a lot about guiding. Every morning we would wake up early and go and collect the horses from their grazing ground, we would feed, water and saddle them before heading in for breakfast. During the day I spent time taking down the camp which involved everything from packing up tents to boarding up windows. When the riders returned from their day trip I helped feed, water and water the horses before leading them out to the nights grazing spot where we put into practice out staking and hobbling skills. Then it was back to camp to cook meals, clean dishes, light camp fires and spend time practising my English with the guests. This experience was just amazing and the best were the people that I shared it with. The confidence, knowledge and experience I gained on this trip was invaluable, the experience changed me as a person and taught me skills that I will take with me on my journey through life; as well as the ability to confidently speak English as a second language! Leslie arrived at the ranch in September to complete our two week English as a second language program and decided to extend her stay. In two months, she became an extraordinary staff member in the Chilcotin Family. She worked hard to prepare the ranch for the winter and, with her typical confidence and take-charge attitude, moved up through the ranks from ranch hand to outdoor manager. 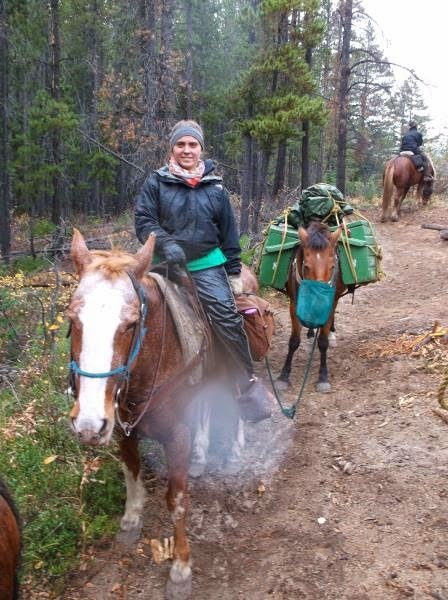 She became an expert in working with horses, going western riding, trimming and shoeing horses, giving riding orientations and was the go to girl when it came to all things horse related, even taking on the responsibility of training Ranger. Leslie excelled at the Ranch and as such, had the opportunity to go on a hike trip up to El Dorado and to become an assistant guide on a 7 day pack trip up to Spruce Lake where she was able to put all of her newly found skills and English as a second language knowledge into practice.